It features many of our favourite singer-songwriters, musicians, and fans from around Seattle (and much farther), including: Wyatt Olney, Tobias The Owl, Wonder, Tekla Waterfield, Jim Marcotte, David Johnson, Brad Yaeger, Rachel Cunha, Paul Jenkins, Dave Pollon, Erika Garrett, Abby London, Stacy Liane Powell, Kate Bradley, Arnaud Hugonie, Travys Starr, and a couple of other mystery voices. I hope you dig it, I think it’s a nice mellow song for when you just want to tune out. Thank you for listening and sharing! We picked up a last-minute gig tonight at Mobster Mike’s in Bremerton WA, the best listening room in Kitsap. 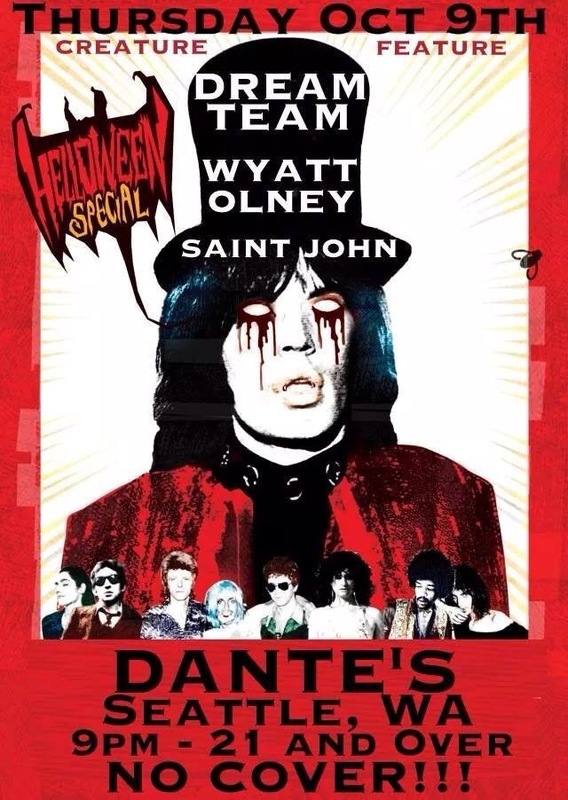 Also performing is Wyatt Olney and the Wreckage and Tyler Jacob Brillhart, 8PM, free entry. Fun. We’ll stay tuned for the verified list also, in case this is a fake created by a nice Seattle band that you might know and love. This is a quick reminder for our show in Everett WA this Saturday at the Firewheel Coffehouse, all ages, $5, also with Amy Bleu, Wyatt Olney, and Aaron Willsie, join us! Dear cool folks of Everett WA, we are performing an intimate show for you at the Firewheel Coffeehouse, also with Wyatt Olney, Aaron Willsie, and Amy Bleu, join us! We have an early show this Saturday at the Skylark Cafe in West Seattle for the soundtrack release to Edge – The Novel, 7PM, $10 cover. Also with many talented Seattle area musicians: Wes Speight, Kimo Muraki, Shades Of Static, Tobias The Owl, Patrick Galactic, Hell Mary, and Wyatt Olney. There will be live painters and the show is all-ages until 10PM. We are on first so get there early and stick around for a fun night! Wednesday May 6 at the Mix Lounge in Fremont, Seattle WA, I’m hosting a singer-songwriter night every Wednesday night, our first one is May 6 with Sarah Pasillas. Open to other musicians after also. Saturday May 9 at Blakeslee’s in Forks WA, All AGES. They say it’s vampire country. Fun. 7PM. Friday May 15 at Mobster Mike’s in Bremerton WA, also with Anna Gordon. A night of super lovely tunes, I promise. 8PM. Saturday May 16 at Cafe Racer in Seattle WA. Also with Amy Bleu coming up from Portland, OR. Surely delightful. 8PM. Friday May 22, at The Mix Lounge in Fremont (soon to be renamed), 501 N 36th St. 8PM. Saturday May 23, at Slippery Pig Brewery in Paulsbo WA. Great beer, good sound, right by the water. ALL AGES. 8PM. Saturday May 30 at the Charleston in Bremerton WA. ALL AGES. Also with: Hunter Stroud, Wyatt Olney, Aaron Willsie, Rich Conrad, Ashton George, and Micah X Wyatt. 9PM. And EVERY WEDNESDAY we convene for the Happiest Hour In Seattle at Bernard’s, 315 Seneca, 5-7PM. $2 well drinks, $3.50 drafts. And free live music from me. Dear Kitsap friends, I am excited to announce that on a regular basis I will come over to your side of the water to give you an excuse to step away from the computer or TV and join us in the real world with real people and real live music! Every third Friday of the month I will be performing at Mobster Mike’s in Bremerton, starting April 17, I can’t wait. This is a fun little spot and I’ve met some super cool folks there. I’ll have a guest performer on with me for the premiere show, the ever delightful Wyatt Olney! These Friday nights are going to be fun. PS. Muchas Gracias to Dave Morgan Promotions for the great promotion work in Kitsap County! Live This Saturday At Flight’s Pub In Everett WA! 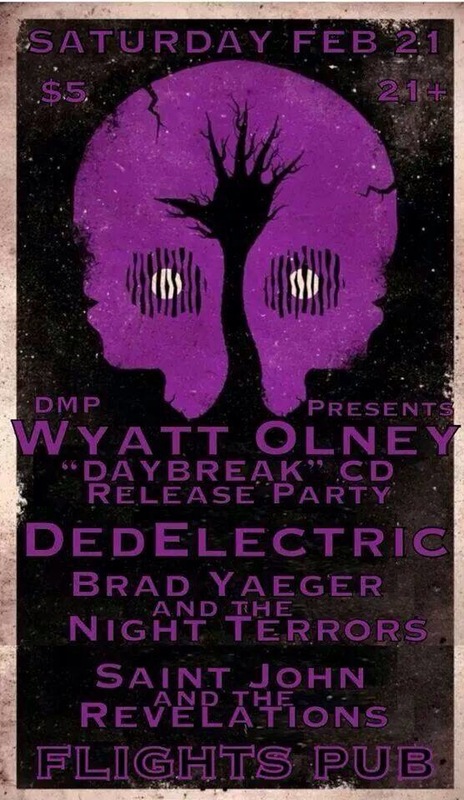 This is Wyatt Olney’s CD release party, and also performing are Brad Yaeger and the Night Terrors. We’re on first so get there early. Bring a friend, they will love you for it! Everett WA friends, join us for a fun night of live music at Flights Pub! We’ll also be enjoying the music of Aaron Willsie, Wyatt Olney, and In The Between! I’m singing some songs (with Phil Hirschi on cello) this Thursday at Dante’s in the University District of Seattle, 8:30PM. Free. I’m headed to Renton WA this Saturday to perform at the Williams Av Pub, 9PM. Also with Wyatt Olney and I The Sky to delight your ears and souls. No cover charge to get in, join us for a fun night! Tonight At Mt Si Pub In North Bend WA!